Pettigrew, an internationally renowned expert on racism and intergroup relations, is receiving the 2018 Scientific Impact Award, an honor shared with UCSC alumna Linda Tropp (Ph.D., '00, psychology), professor of psychology at the University of Massachusetts, Amherst, and a former graduate student of Pettigrew's. The award recognizes past articles about psychology that have proven "highly influential." The winning paper, "A Meta-Analytic Test of Intergroup Contact Theory," has now been cited more than 5,300 times; it appeared in 2006. In it, Pettigrew and Tropp analyzed 515 studies and found that intergroup contact tends to reduce many types of prejudice. The award will be presented in October in Portland, Oregon, at the society's annual conference. 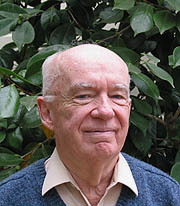 Pettigrew officially retired in 1994 but has continued to publish on a range of topics, including the appeal of Donald Trump.